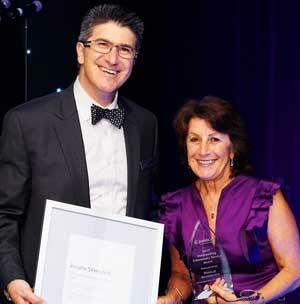 Over 660 people gathered at Jewish Care’s Gala Dinner, recently held at Melbourne’s Caulfield Racecourse, launching the 2012 Annual Appeal in support of those in need in the Victorian community. This year’s Annual Appeal theme, Giving is in Our Nature, has emphasised human individuality and that the ability to give is hardwired within each person. “Our parents and grandparents came to Australia with little or no means to support themselves, and yet, they always found ways to share with others. From a very young age, we were nurtured by our families with certain values and traditions. Giving tzedakah is an integral part of all of us,” said Bruce Rosengarten, Jewish Care’s President. This year, Jewish Care aims to raise $5.3 million to cover the ongoing provision of its vital community services, including housing assistance, financial services, counselling, Healthy Ageing programs, mental health services, cultural and spiritual services, information and referral and kosher food service. These programs receive little or no government funding, and rely primarily on public donations. Throughout the Gala Dinner, participants were moved by captivating presentations, including an inspirational film, It’s Wonderful, highlighting Jewish’s Care role in strengthening the wellbeing of the Victorian Jewish community and securing its sustainable future. The audience warmly welcomed the keynote speaker, Simon Griffiths, a leading innovator in the social enterprise sector, who spoke about how consumer-driven philanthropy is making a true difference in the developing world. The Outstanding Community Service Award was presented to Rosalie Silverstein, a dedicated Jewish Care volunteer for over 35 years. “Giving is growing. It changes your life. I’ve learnt so much from it,” said Rosalie. Rosalie is also well known for running the Posh Opp Shoppe on Glen Huntly Rd, which pays for over 170 Jewish children with disabilities to have carers at school. 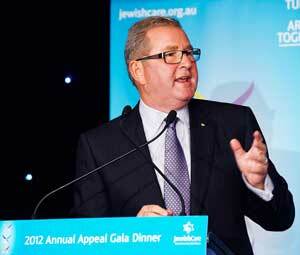 The Gala Dinner night has set a successful start to the 2012 Annual Appeal campaign, aiming to assist Jewish people of all ages and abilities to build their capacity, establish long-term security, achieve their goals and live full and meaningful lives.